THE Israeli military - Israel Defence Forces (IDF) has launched its own channel on video-sharing website YouTube, posting footage of air strikes and other attacks on Hamas militants in the Gaza Strip. The IDF Spokesperson's Unit is the Israel Defense Forces' professional body responsible for media and public relations in Israel and around the world. This is our new site that will help us bring our message to the world. We were saddened earlier today that YouTube took down some of our exclusive footage showing the IDF's operational success in operation Cast Lead against Hamas extremists in the Gaza Strip. Fortunately, due to blogger and viewer support, YouTube has returned some of the footage they removed. We thank you for visiting us and will continue to update this site. NOTE: Some videos are removed by YouTube. LiveDrive is a total revolution in how you store, access and manage your files. Note: LiveDrive has got NOTHING to do with Microsoft Live services. Microsoft's very own file upload service is codenamed SkyDrive. From healing credit markets to a coming wave of big government stimulus spending, evidence is mounting that the historic 2008 sell-off in Asia may fade into the history books. Singapore listed blue chip, Singapore Technologies Engineering (ST Engg), order book for year 2008 swells to over $10 billion after the latest contracts for works at Resorts World at Sentosa (RWS). SINGAPORE Technologies Engineering (ST Engg) yesterday said it has secured $86 million in contracts for works at Resorts World at Sentosa (RWS), bringing its order book to a record high of more than $10 billion. 'With this deal and various other contracts secured in the fourth quarter of this year, despite an unprecedented very challenging second half 2008, our order book as at end 2008 will exceed $10 billion, which is an all time high,' said president and chief executive officer Tan Pheng Hock. The latest contracts are to supply an integrated security system, an IT infrastructure system and a car park guidance and payment system to the upcoming integrated resort and were awarded to ST Engg's electronics arm ST Electronics. The contracts are the first major win for ST Electronics from an integrated resort. ST Engg said in a statement that work will begin immediately and that the systems will be delivered over the next two years. The contracts are not expected to have any material impact on the consolidated net tangible assets per share and earnings per share for the group's current financial year, ST Engg said. The company said its security systems are currently installed in Dubai and Beijing as well as the Singapore Management University. Its carpark management systems are implemented in the Esplanade, Plaza Singapura and Tampines mall, among other places. Two weeks ago, it announced it was selling &pound150 million (S$315 million) worth of armoured vehicles to the British army for use in Afghanistan. A day later, the company said it had won a contract to supply &pound35 million of 40mm ammunition, again to the British armed forces. ST Engg closed at $2.36 yesterday, up seven cents, or 3.1 per cent, on volume of 1.3 million units. The below article is published on Hong Kong's South China Morning Post newspapers and it is very real. A Ponzi scheme is a fraudulent investment operation that involves paying abnormally high returns to investors out of the money paid in by subsequent investors, rather than from the profit from any real business. Bernard Madoff, a former chairman of the Nasdaq Stock Market, was arrested and charged on 11 Dec 2008 with allegedly running a US$50 billion "Ponzi scheme". This fraud could be written into the history book as one of the biggest fraud cases ever. The list of individuals, banks, charities and investment firms exposed to losses in Bernard L. Madoff's investment funds continues to grow. This list is published annd maintained by the New York Times here. Microsoft says there is a problem with Internet Explorer that could leave users open to theft of critical personal information. They have released a patch and is available for download from automatic update. ]ust a year ago, Royal Bank of Scotland (RBS) paid US$100 billion to acquire Dutch ABN Amro. Temasek Holdings and Barclays jointly contested for ABN Amro too but lost to RBS eventually. Discussions were made just before the current sub-prime bubble blew up. With the above acquisitions, we are still left with a balance of US$8 billion. The nonprofit group Consumer Watchdog asked on Friday that Google give users of its search engine the ability to "opt out" of leaving personal data, such as IP addresses, on Google's servers. Ask.com, another search engine, already has this "opt-out" option. 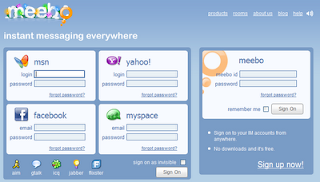 Popular online Instant Messaging (IM) website, Meebo!, has added 2 new networks - MySpaceIM and Facebook Chat. Already, Meebo! supports MSN, Yahoo!, AIM, GTalk, ICQ, Jabber and Flixster. OpenOffice.org Portable is a complete office suite -- including a word processor, spreadsheet, presentation tool, drawing package and database -- packaged as a portable app, so you can take all your documents and everything you need to work with them wherever you go. OpenOffice.org Portable 3.0 is a free downoad for any USB thumb drive, however, it runs only on a Windows system (or Linux/Unix system with WINE). The internet entrepreneur, Briton Alex Tew, who made million dollar by selling pixels online each on milliondollarhomepage made headlines again. This time round, Alex Tew is behind an online video game, hosted as sockandawe.com, inviting users to throw footwear at President George W. Bush. The property was sold on eBay in just four day at US$7,818. Google Gmail says Gmail run an average of twice as fast when fully supported browsers are used. With a fully supported browser, one can experience all the features opened by Gmail. An article from FreewareGenius reveals methods to convert PowerPoint ppt files to DVD for free. PowerPoint to video to DVD: using “EM PowerPoint to Video Converter Free” (PPT to AVI), then doing the DVD authoring using DVD Flick (AVI to DVD). PowerPoint to Flash SWF to AVI to DVD: using iSpring Converter Free (PPT to SWF); then using either SWF2AVI or CamStudio (SWF to AVI), and finally DVD Flick (AVI to DVD). PowerPoint to JPEG to DVD: using PowerPoint Image Copier (PPT to JPG) then authoring a DVD slideshow using DVD Slideshow GUI (JPG to DVD). Gizmodo has an article that explains everything about hard disks - SATA, ATA, eSATA. I will be away from 9 to 28 December 2008 and will only be back on 29 December. During this period, internet access will not be readily available to me. I do hope to come online if there is the slightest opportunity, to stay abreast of what's happening around me. I feel so out of touch and handicapped without internet access. CONTRITE United States auto-maker bosses admitted errors and agreed to strict government oversight, but their pleas to sceptical Senators still won no guarantees of a US$34-billion ($52-billion) bailout. After top executives of the Big Three car giants endured a sapping near-six-hour grilling :on Thursday, top Democratic Senator Chris Dodd said he would try to mount a last gasp bid to stave off a “death sentence” for the industry. But President George W Bush said Chrysler, General Motors and Ford must prove their long-term viability if they want government cash, reflecting the tensepolitical sparring over the iconic firms’ fate. Backers of the bailout warn that the failure of one or more of the top auto manufacturers could severely batter the already reeling US economy and would wipe out millions of jobs which rely on the industry. “Nothing concentrates the mind like a death sentence,” Mr Dodd said, but cautioned he was not a “miracle worker” and said Congress was not about to simply write a no-strings-attached cheque forUS$34 billion. It remained unclear, however, whether the votes yet exist to pass a bailout andMr Bush’s intervention cast further doubt on the rescue plan. “No matter how important the autos are to our economy, we don’t want to put good money after bad,” Bush said. Earlier, the car bosses put on a show of humility at the Senate Banking Committee hearing, after being sent back to Detroit to retool their restructuring plans two weeks ago. The three men drove small cars on the 845km journey to Washington, rotated driving duties, and ate at a mass market sandwich chain. They pledged to cut jobs and costs, sell off subsidiaries, shelve unprofitable models and develop cars which run on new generation fuels, and on Thursday offered to submit their restructuring to a federal oversight board. “We’re here today because we made mistakes, and we’re here because forces beyond our control have pushed us to the brink,” GM chairman and chief executive officer Rick Wagoner told the Senate committee. Now you can get a free Gmail stickers designed by the Gmail team for free, however, you will need to just provide them with a self-addressed envelope with a return stamp to your own country. 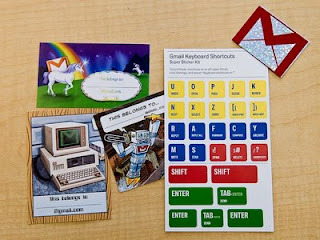 The sticker is supposed to provide a quick and visual guide on the handy shortcuts available to use Gmail. To turn these case-sensitive shortcuts on or off, click Settings, and then pick an option next to Keyboard shortcuts. Do also include adequate return stamp back from the United States to your country. Be quick while stocks last. Lots of folks rave about Microsoft Office 2007's ribbon interface, but now you can have it for free in Microsoft Word's younger sibling, WordPad. A developer over at deviantART—not Microsoft, mind you—has released "Wordpad 2009," which offers multiple documents in tabs, Windows 7 icons, and yes, the ribbon interface. Ever encountered error when trying to run a SQL script file (.sql) with "GO" statements using ADO.NET SqlCommand.ExecuteNonQuery? The error occurs because "GO" statement is not a valid Transact-SQL statement. To run the SQL script file using ADO.NET, there are 3 methods. The first method is to remove all "GO" statement in the file before running them in ADO.NET. Second method is to perform a split (tokenize) the file content using "GO" as the delimiter. The third method is to make use of SQL Server Management Objects (SMO). The below is a code snippet applying the third method - Using SMO. Do take note that references to Microsoft.SqlServer.Smo.dll and Microsoft.SqlServer.ConnectionInfo.dll are required. The below article is a valuable source and provides clear instruction on how to change instance name of SQL Server. The key is the below statements. Facebook's 120 million users are being targeted by a virus dubbed "Koobface" that uses the social network's messaging system to infect PCs, then tries to gather sensitive information such as credit card numbers. It seems to me virus targeting operating systems are on the downtrend and social networking sites are on the uptrend. Google is all about speed, both under the hood as well as in the user experience. So, in order to make Reader act and feel more speedy and responsive, we've removed some visual clutter, simplified some features and given everything a bit more breathing room. Out with the old rounded corners, drop shadows and heavily saturated colors -- in with a softer palette, faster components and a fresh new look. Public Transport Council Chairman Powerless? It has been ages and the issue of why tertiary students like full-time students from Polytechnics and Universities have to pay significantly higher transport fares as compared to non working peers from Junior Colleges and ITEs still lingers. Just this month, petitions are set up to help bring this issue to the public and hope the government can bring some fairness to these group of tertiary students. The government should be mindful full-time tertiary students are without an income and they require monthly allowances from family. Having to pay approximately 80% higher transport fares is nonsensical. Public Transport Council (PTC) chairman, Gerard Ee, pointed out that its hands are tied. "It's not within our power to force operators to give concessions - that's up to the operators. We can only encourage operators to continue to be generous with transport cuts." Regulating bus and train fares. I am now getting confused about the role of the PTC. Just what can the public do? The OpenXML Document Viewer team is pleased to announce the release of the first version of the Open XML to HTML project. The OpenXML Document Viewer project provides plug-ins and tools to view MS Word 2007 documents on platforms where Word 2007 is not available. This is achieved by using the OpenXMLViewer browser plug-in or the command line interface to convert the Word document (.docx) into HTML. This viewer is available for both Windows and Linux. You can even open a OpenXML document like Word 2007 in Firefox. If you do not wish the "Search Box" to be there, there is a method to remove it. Simply append a new parameter &showsearch=0 to the video URL and the "Search Box" will be gone for good like below. Do note that &showsearch=0 is case sensitive. Microsoft has announced Service Pack 2 (SP2) for Windows Vista is to be released by first half of 2009. So what is in it for me in Windows Vista SP2? It is our goal that applications that run on the Windows Vista Operating System today and are written using public APIs will continue to work as designed on Windows Vista SP2. It is announced that electricity tariff is to be reduced by 24.7% for Q1 2009 (January 1 to March 31). This fall is due to falling fuel prices. The scheduled reduction will effectively bring electricity tariff to level close to the one before recent massive hike of 21%. Popular blogger, Mr Brown, published a podcast and commented on the recent investment failure by Singapore's town councils. Podcast in mp3 format can be downloaded here. The podcast seems to be targeted at one particular person, whom I shall not mention here. Google has completed the purchase of 20 million digitized historical newspaper pages from PaperofRecord.com. The two have had an agreement for two years and has now concluded in a sale that was voted on by shareholders of PaperofRecord's parent company, Cold North Wind, Inc. This should be quite an asset to Google's historical newspaper initiative, announced in September. The U.S. economy is now officially in a recession since last December, making this downturn a long one year old. This effectively makes it the longest ever in a quarter century. The National Bureau of Economic Research (NBER), the chief arbiter of U.S. recessions, has confirmed and decided that this recession began last December, making it the 11th post-war recession. Only two post-war recessions have been longer — November 1973 to March 1975, and July 1981 to November 1982. NBER has suggested the current recession is very likely to be the longest since the Great Depression. The new Windows 7 will run fully accelerated graphics from your CPU using technique called Windows Advanced Rasterization Platform (WARP). WARP is a tech which will allow your PC's CPU to act as a graphics accelerator, possibly doing away with the need for integrated graphics hardware to render user interfaces and low-end games. Microsoft has learnt its lesson with Vista and this time round, could help avoid another "Vista Capable" type debacle. I am now a student again and this entitles me to student privileges (if any). How to use free GovWiFi in Hong Kong? Currently, most government premises in Hong Kong are WiFi-enabled as part of a major initiative under the 2008 Digital 21 Strategy to build Hong Kong into a wireless city. Set the Network ID (SSID) to "freegovwifi-e" and click "Connect"
Open your web browser and accept "Conditions of Use and Disclaimers"
There is security risk in using unencrypted connection "freegovwifi". Please use the encrypted connection "freegovwifi-e" if your Wi-Fi device supports IEEE 802.1x and WPA-Enterprise (or WPA2-Enterprise). If your device cannot support IEEE 802.1x and WPA-Enterprise / WPA2-Enterprise and you just want to transmit non-sensitive information or use for general browsing, you may set the Network ID (SSID) to "freegovwifi".